Large, chunky chocolate chip cookies with 2 scoops of delicious ice cream wedged in between and all topped off with sugared, whipped cream and hot chocolate sauce. 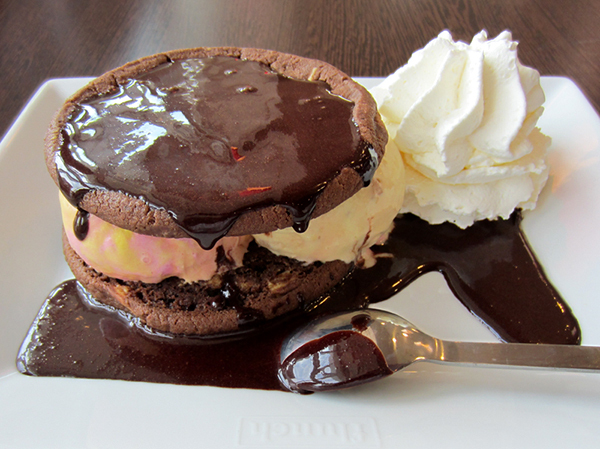 Ice cream sandwiches don't get much better than this! The ice cream flavors in this sandwich were bubblegum and banana. Ideal for kids but personally I prefer straight chocolate and vanilla ice cream. Old fashioned? Maybe, but oh so good!